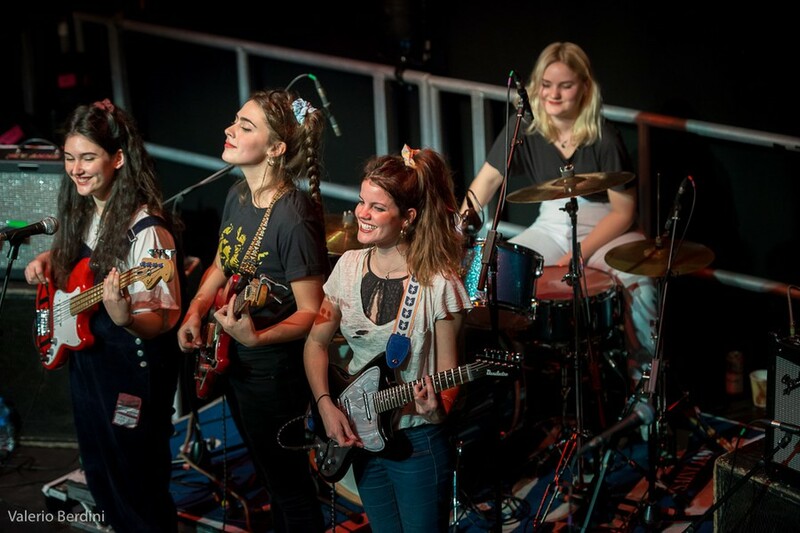 Hinds playing at the Cambridge Junction in 2016. Hinds, a garage-rock band hailing from Madrid, played Sunday night at Lincoln Hall. The final act of the past week’s Tomorrow Never Knows (TNK) music festival, the all-female headliner was opened by Peel, a gritty, Chicago-based group, and Sløtface, a punk band from Stavanger, Norway. Lincoln Hall was one of four Chicago venues that hosted this year’s TNK fest, which purports to gather “the best of rising local indie artists as well as acclaimed national acts, including both musicians and comedians.” This year’s lineup also featured Diane Coffee (aka Shaun Fleming), former touring drummer for the popular psychedelic group Foxygen, and Destroyer, a Canadian rock band that has been active since 1995. It seems that music festivals these days are as much about now-trite “festival fashion,” celebrity-laden performance rosters, and famous attendees as they are about the music itself. TNK flies in the face of the traditional music festival, which is typically a series of outdoor shows at the same large venue taking place over a weekend or two. The festival took place January 17–21 in intimate venues dispersed across the city, a refreshing take on the festival concept. “I’m still nervous,” remarked band member Carlotta Cosials several songs into Hinds’s rambunctious set. By the time the band took the stage last Sunday night, Lincoln Hall was packed and the audience was animated, perhaps still riding the high of Sløtface’s opening. It was clear that the band had garnered a steady fan base; the audience often shouted along to song lyrics, word-for-word. This enthusiasm was matched, perhaps even magnified, by the animation of the performers themselves. Ana Perrote and Cosials play guitar and share lead vocals, while Ade Martín provides backup vocals and bass and Amber Grimbergen plays the drums. The musicians are natural rockers, and seemed to be living it up despite Cosials’s admission of stage fright. Their show felt like a private performance from your best friends, if your best friends were members of an internationally known rock band and also ridiculously, effortlessly cool. Perrote, Cosials, and Martín marched comically back and forth across the stage in sync and performed dance numbers during the instrumental sections of “Caribbean Moon,” a single released in 2017, much to the audience’s mirth. “Want to see something weird?” asked Cosials, before linking arms with fellow frontwoman Perrote. The two wrapped their arms around one another so that they were able to strum the opening bars of “Chili Town” on each other’s guitars, garnering loud cheers and many phone recordings. One last unexpected feat of showmanship came when they invited well-known Chicago band, Twin Peaks, onstage to perform a song. “Is Twin Peaks here? I want full attendance,” commanded Cosials, and the crowd went nuts when the band sauntered on. Asked if she was a fan of Hinds, one audience member said “I know them from Twin Peaks.” The band coheadlined with Twin Peaks this past summer and performed with them at Coachella, but they have risen to stardom in their own right. Perrote and Cosials began making music on Bandcamp under the name Deers in 2011. After a year’s hiatus, they resurfaced as Hinds with Grimbergen and Martin. With their first album, Leave Me Alone (2016), and several popular singles already released and well-loved, we can look forward to Hinds’s sophomore album, I Don’t Run, which is set to drop on April 6. The group has an impressive, distinctive sound: Their vocals are at times raucous and joyful, at other times, melodic and harmonized. Cosials’s voice is at times satirically saccharine and at others bold and angry. Perrote sings at a lower register and has a more straightforward, smooth style which provides a refreshing contrast to her counterpart. The style of shared vocals shows ambition and innovation. Additionally, the band’s dark, alt-twee, guitar-heavy style, is reminiscent of the Velvet Underground and other early iterations of the genre that we know as “alternative.” Finally, Hinds’s Spanish roots, which are evident in their slight accents and certain songs which incorporate Spanish, such as “Castigadas En El Granero” and “Holograma,” set them apart as they operate in a music scene that is dominated—if not by native English speakers—then certainly by English music. Hinds’s show drew energy from a crowd of Chicago residents on a Sunday night, in the middle of winter nonetheless. They are an impressive band for their musical skill and synchronicity, for their style which perches on the thin line between unique enough to warrant artistic merit and catchy enough to dance to, and for their charisma. These qualities cannot, for the most part, be taught; they are qualities that come from strong instincts and a natural propensity to create. Expect I Don’t Run to expand on their burgeoning potential.